If Arup's relationship with Christiani & Nielsen provided an important bridge between his theoretical training and the reality of engineering as a business, his introduction to architect Berthold Lubetkin (1901-1990) represented his first opportunity to put his own ideas into practice. He dreamed of a more intimate relationship between architect and engineer, a focus on total design, or as he phrased it in later papers, 'total architecture', a phrase that echoes the title of influential architect Walter Gropius' 1956 book, The Scope of Total Architecture. 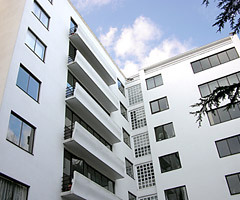 Born in Georgia, Lubetkin had arrived in London in 1931 after time spent in Berlin, Warsaw and Paris. In 1932 he set up the radical architectural partnership Tecton with Francis Skinner, Denys Lasdun, Godfrey Samuel and Lindsay Drake. He met Arup in 1933 when he was referred to Chistiani & Nielsen's London office after seeking advice at their Paris office in connection with the project he was working on, the Gorilla House for London Zoo. With the political situation in central Europe becoming more and more difficult, many intellectuals were moving to London. Lubetkin was followed by such distinguished figures as Sigmund Freud, art historian Nikolaus Pevsner, architect Ernö Goldfinger and, eventually, Gropius himself. In 1933, before he met Lubetkin, Arup joined the Architectural Association, which offered a vibrant forum for exchanging ideas about contemporary building design and an equally important source of ideas about the architect-engineer relationship. He would later give a series of short annual lectures there on reinforced concrete design. It was through Lubetkin, however, that Arup joined MARS — Modern Architectural ReSearch — a small radical centre left group affiliated to CIAM (Congrés Internationaux d'Architecture Moderne), of which Le Corbusier and Gropius were leading figures. CIAM, whose leading members were the leaders of the Modern Movement, was engaged in a reassessment of architecture. At this time, Arup was working on the aforementioned Labworth Café, as architect, engineer and contractor for Christiani & Nielsen. Although the design has an obvious Modernist influence, he didn't commit himself to the Modernists' strong belief in functionism, though he later acknowledged a debt to MARS. He admired Gropius' 'goal of unity' — the Bauhaus vision that brought together craftsmen, artists and architects — and Le Corbusier's enthusiasm for engineering and passion for following the 'laws of nature'. In early 1934, Arup joined contractor J.L. Kier & Co., who were reinforced concrete specialists of Danish origin. He was made director in charge of tenders and chief designer, and was to stay until 1938. He joined Kier with the stipulation that he could develop his professional connections with the Modernists, and thus began his long association with not just Lubetkin and Tecton but a number of significant architects, including Wells Coates (1895-1958), Maxwell Fry (1899-1987) and Ernö Goldfinger (1902-1987). He would work as consulting engineer with these last three after World War II. 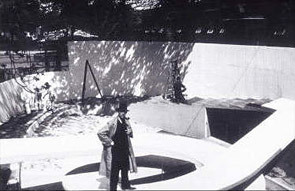 Arup considered Lubetkin's influence as formative, and praised him as his first real teacher of architecture. They were both perfectionists and Arup was keen to exploit his own knowledge of concrete in conjunction with Lubetkin's artistic vision and awareness of new technologies. 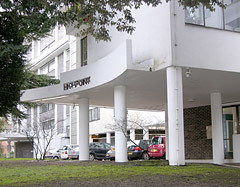 Arup's collaborations with Lubetkin and Tecton include such iconic London structures as the Penguin Pool at London Zoo, the apartment blocks Highpoint I (1935) and Highpoint II (1938) in Highgate, and Finsbury Health Centre (1938). The Penguin Pool established their reputations. 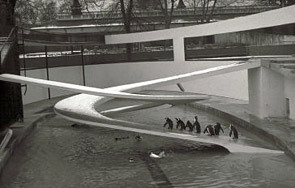 The interlocking spiral ramps, whose playful form took inspiration from behaviourist research and was intended to mimic the penguins' natural habitat, cantilevered off two slim columns, and appeared to soar above the pool entirely unsupported. The influence of Cubism is apparent in the shape of the ramps, the oval plan of the pool and enclosure, and its rendered screen walls. While Arup was working on it, Felix Samuely (1902-1959) was hired as his assistant, a position he held for nine months. The two apartment blocks, Highpoint I and Highpoint II, are sited on one of the highest points in London and are considered pioneering examples of design method and construction. Here, Arup could reevaluate and move away from his earlier disappointment with the Labworth Café, using not disimilar techniques but advancing his understanding of how best to apply his skills. It was here that he began to gain a reputation for "doing tricks with reinforced concrete". Arup suggested the use of external loadbearing walls and floor slabs supported on spine beams, a combination that provided greater clear floor area. Of equal note is his introduction of climbing shuttering, a concrete construction technique then only in use for industrial projects. This approach to multi-storey concrete pours uses a moveable formwork system, which largely dispenses with scaffolding. At Highpoint, the shuttering was raised by jacks, three lifts per storey. The team won a prize for the shuttering and toured France with the proceeds to look at Le Corbusier's work. 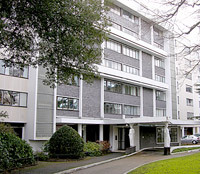 In 1935 the Lubetkin-Tecton-Arup collaboration won a design competition run by the Cement Marketing Company for working-class residential flats. Their solution, in reinforced concrete using the same structural principles and construction techniques as Highpoint I, was published in National Builder. In the summer of that year, Arup's article 'Planning in Reinforced Concrete' was published in Architectural Design and Construction. In it he proposed that concrete structures should be conceived as one unit with the joints as strong as the rest. He saw aesthetic potential in this approach — any shape could be achieved. This was a radical idea at a time when the strength of concrete walls wasn't even considered in frame calculations for reinforced concrete frame buildings. Working for Kier held Arup back to a certain extent in that he had to tender for projects rather than offer his services directly. In 1938, he left and set up independently with his cousin Arne in Broadwick Street in Soho. Mathematician and structural analyst Ronald Jenkins, who had joined Kier in 1935, followed him. 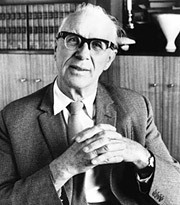 Ove and Arne formed Arup & Arup Ltd as civil engineers and contractors. The company would last until 1946. It was a sign of the coming times that some of his last work for Kier included sheds for the War Office at Purfleet and Sheerness, and reinfoced concrete aircraft buildings for the Air Ministry at Kemble, Gloucestershire. Arup's vision for architect-engineer collaboration is somewhat indebted to the Modernist masters but how he put this vision into practice was to be significantly tested during the World War II. Arup and Lubetkin continued to collaborate but their relationship occasionally became heated. They did not see eye-to-eye idealogically, which became apparent through various public shelter-related episodes. By 1946, their interest in working together was waning, though they still met regularly. 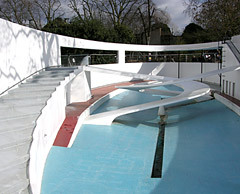 Penguin Pool, London Zoo, as it is today. The penguins now live in another enclosure. The entrance to Highpoint I. The adjacent and slightly later Highpoint II can be seen in the background. 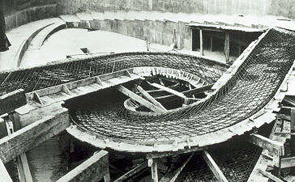 The spiral concrete ramps of London Zoo's Penguin Pool under construction (completed 1935). Ove Arup on site at the Penguin Pool. Felix Samuely (1902-1959), who was Arup's assistant for nine months and worked on the Penguin Pool.